My husband Chris and I are in the process of heading to that impossible-to-describe annual ‘festival’ in the desert, Burning Man–though it’s really not a festival so much as a community, social experiment, and once-in-a-lifetime experience. Chris and I are full-time RV’ers, and I must admit I’m a bit nervous in taking our motorhome to Burning Man—I don’t want it to get negatively affected by anything—like the weather, for instance. We’ve always tented in the past, and I know how fierce the conditions can be out there. I’ve attended 5 times before, and there’s always something to contend with, whether it’s the oppresive heat, the torturous cold, the rain and its immobilizing mud, the wind and its whiteout dust, etc. Chris has done a lot of research to protect our motorhome from the elements, but even so, I’m keeping my fingers crossed. We’re currently at an RV park outside Reno (with a spectacular view of the surrounding mountains), preparing for our BM experience. We met our temporary neighbors earlier this evening, a lovely senior couple. We met the husband first. Upon hearing that we were going to Burning Man, I could read the look on his face. It’s easy for me to tell if people are immediately ‘for’ or ‘against’ it—and, usually, I see some sort of smirk on many faces. So I immediately launch into its defense—how it can’t be described, only experienced; how the people there are really much more intelligent than some may think (after all, some of the greatest minds in the nation go there for ‘thinktanks’), but Bob was pretty steadfast in his opinion that it was really a gathering of people getting really covered in dust and doing drugs. And, admittedly, everyone gets really dusty, it’s true. In order to maintain a sense of sanity at Burning Man, you kinda have to just throw your normal hygiene routine out the window. Wash and/or disinfect your hands frequently, yes, and do your best to keep your ‘nethers’ clean, but you. Will. Get. Dirty. But I told him that the drug thing is not in your face. 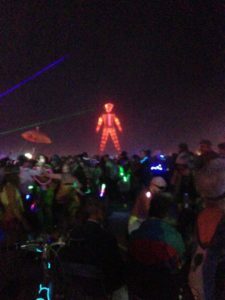 I really believe that a person can go to Burning Man and have an experience in which you’re not overly affected by partying people. Sure, there are lots of people who are drinking and drugging, and parties happening (HUGE parties, if you want ’em), but it’s definitely possible for one to consciously construct an experience to avoid any vibe that you don’t want to be around. I don’t actually see people openly doing drugs, unless you count drinking alcohol, and that’s at their camps, or established parties and ‘bar/tavern’ camps. I explained that Burning Man really is like an experience of a ‘normal’ city, in that you get all types of people, including people who party. For instance, in traveling from one place to another, you’ll likely pass the local tavern with its partakers, and in traveling through different neighborhoods see all sorts of people, even the occasional passed-out drunk against a wall. But, like modern urban life, you also have your art galleries, coffee shops, live music, and cultural happenings. I further explained that it seems to me that Burning Man is like a big mirror, reflecting back stuff you need to work on, or other truths. 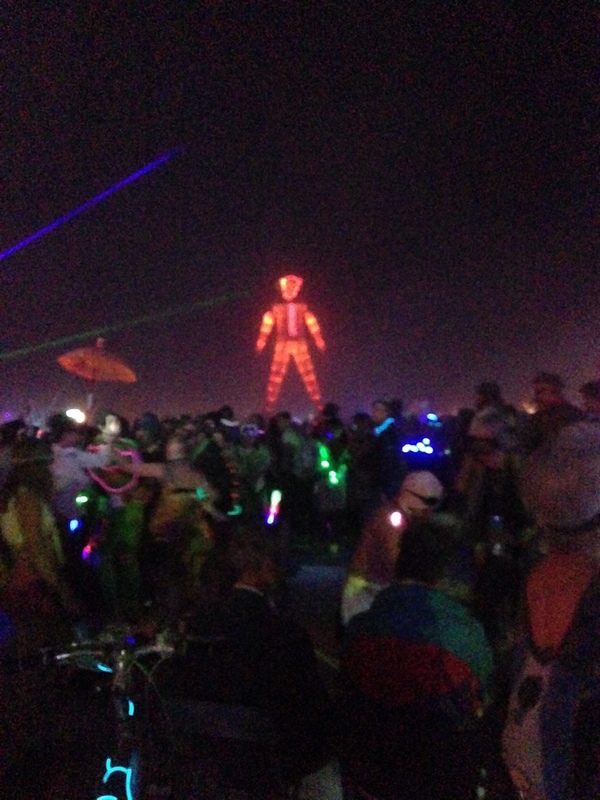 But some can’t handle it, and hate the experience so much that they leave Burning Man as soon as possible; incredulous that so many would find the experience worthwhile. Others, like myself, see the blessings and the teachings that are found there (it can be an incredibly spiritual experience), and are somewhat able to stay conscious of any triggers that occur, and work on releasing them in the moment. I don’t think I changed my neighbor’s opinion of the event (not that I was trying to). I still believe that he thinks it’s a bunch of drugged-up jerks in the desert, and it’s this thought that keeps me from being truly excited about going. Because I know—perhaps more than anybody—that this could be the year in which it’s ‘jumped the shark’ for me. The year that I encounter more assholes than angels; that I could be the one to hate the experience and want to leave early.